The process of giving a lesson is very easy. 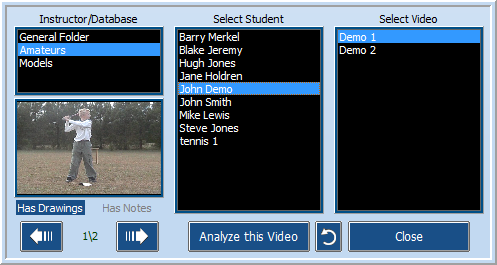 Use the first three buttons to create a new student, capture their videos, then analyze the new videos in the analysis section. 1) Click on the "Student Profiles" tab, then click on the "Add New Student" button. You will need to do two things here. First choose the database that you want the new student to be listed under (Amateur, Models, etc), then, simply fill out the information list (with as little or as much information as you like). Clicking the save button will add the new student to the system. (Note: You can add, change or delete all information at a later date). 2) Click on the "Capture Video" tab. You will notice that the new student has "followed" you to the capture section. This means that any videos that you capture will go into that students’ folder. Note: You will notice at the top right half of the screen that the program will show you the name of the next video that you will capture. You can change it by clicking the appropriate buttons below the name to make it reflect your new student's viewing angle. NOTE: These directions are for DV Camcorders. Directions for the new memory cameras are slightly different. Turn on your video camera and you will see that whatever is displayed in your viewfinder will be displayed in the capture window. When your new student is about to make the motion you want to record, click on the "Start Capture" button (the button will then show the caption "Stop Capture"). Click on the "Stop Capture" button (same button as "Start Capture") when your student finishes his/her motion. You will now see that the "live video" window has been replaced with the video that you just captured (SportsCAD will now automatically pause your DV camera). Scroll the newly captured video to the beginning of the motion (we want to remove any excess video that you may have captured) and click the "Trim Front of Video" button. Scroll the video to the end of the motion and click the "Trim End of Video" button. This "trimming" process will make sure that we only save the motion itself and no extra frames. Click on the "Save Capture" button to save the video to your computer. You can repeat step two above for as many captures as you need. 3) Click on the "Analyze Video" tab. Double click on the empty video window and the OPEN dialog box shown below will appear. You will again notice that the student has "followed" you to the Analysis section. In the "Select Video" window, highlight the video file that you are interested in analyzing and click "Analyze this Video" (or just double click on it). The selected video will then appear in the highlighted video window. Now you can either: click and choose a "Model Video" to compare with your new student, or, select "Close" to close the window. Note: If you are in Single screen mode and choose a model video to compare to your student, SportsCAD will automatically switch to Dual screen mode to accommodate the model video. Congratulations!! 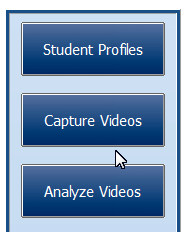 You have now successfully added a student, captured their video(s) into your computer, and loaded the video(s) into the Analysis section.